The British charity Khalsa Aid turned its attention to the crisis in Kerala this week as the number of dead from devastating floods reached nearly 400. Tens of thousands more have been left homeless across the southern Indian state and the danger is not over yet. More "heavy rainful" is expected over the next few weeks. The government has set up over 3,700 medical camps and at least 5,600 relief camps, according to Indian media. Close to a million people are now living in these camps. The government says it has enough food to feed people, but is having trouble transporting it across the state. No outbreaks of diseases have yet been reported but there are concerns about the lack of clean drinking water and mosquito infestation. Kerala had received over 250% of normal rain in August, forcing the state authorities to release water from its dangerously full dams. The overflowing dam water flooded villages and destroyed vital infrastructure across the state. Ravi Singh from Khalsa Aid tweeted yesterday: "We are stepping up our aid efforts for those affected by #KeralaFloods ! 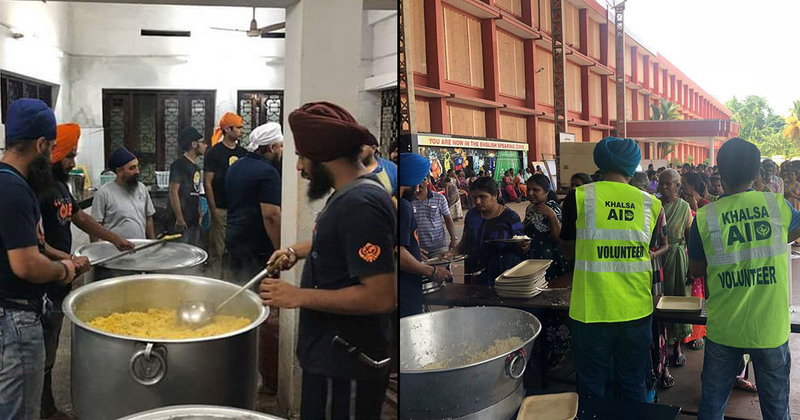 We are already providing hot meals to over 2000 people, this will be doubled in the next 24 hours & another team despatched from Panjab." Khalsa Aid is a British charity but has a relief arm in India called Khalsa Aid India. Its director Amarpreet Singh is leading efforts there. It started soliciting donations over the weekend in an effort to increase relief efforts. Our team has reached the floods hit Indian state of #Kerala. "We are facing huge challenges as more heavy rains are forecast in #Kerala and the flood waters are rising." Amarpreet Singh, Khalsa Aid India. Khalsa Aid is not alone in the area of course. It is among thousands of volunteer groups and aid efforts focusing on the state in recent weeks. Many have also urged donations to the official Distress Relief Fund (readers on desi forums pointed out that though the official Fund was run by the government, it was transparent and independently administered). American organisations such as Akshay Patra are also raising funds for relief efforts there. You can donate to Khalsa Aid go through their website.